More than 60 workers at Keck Medical Center at the University of Southern California voted overwhelmingly to join NUHW in the past month. NUHW now represents more than 1,000 workers at two USC hospitals — Keck Medical Center and Norris Cancer Hospital. On April 12, 17 workers at Keck’s Beverly Hills clinic voted 94 percent to join NUHW. Six inpatient radiology workers voted March 29, and nearly 40 lab and outpatient radiology workers voted to join March 23. We have two more elections scheduled later this month for other USC workers seeking to join our union. These recent wins come on the heels of last year’s victory of more than 170 service, technical, and Sodexo-employed workers at Norris Cancer Hospital, who are now in bargaining for first-time contracts. 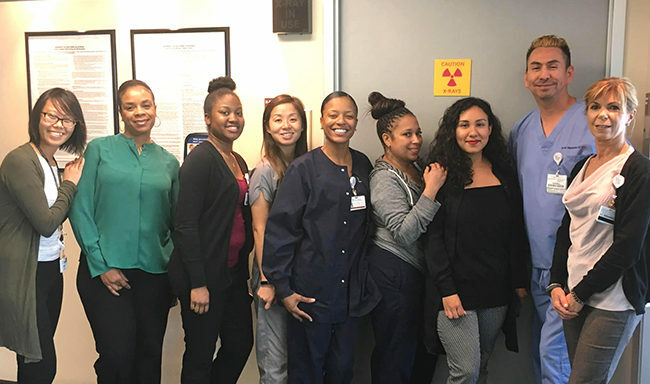 Keck and Norris workers’ goals are to improve staffing and the quality of care at the hospital, protect benefits, and achieve parity with NUHW-represented service and technical workers at USC, who won a strong contract last year. Keck service and technical workers won parity with other USC workers on retirement benefits and tuition assistance; USC-paid health insurance for workers and their families; guaranteed annual wage increases that take into account their experience and years of service at USC’s Keck Hospital; and most important, a voice in the hospital’s staffing and safety policies through a Patient Care Committee. Members led the way in the contract campaign, garnering support from elected officials, speaking out at Los Angeles Board of Supervisors meetings, educating the public through traditional and social media, sharing a video that exposed USC’s poverty wages and declining patient-care standards, and engaging in other workplace actions.